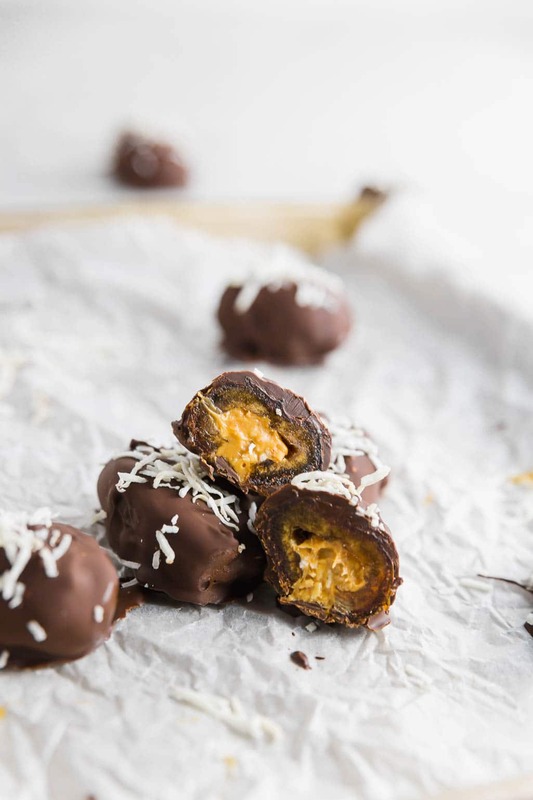 With only 6 ingredients, you’ll love these chocolate covered peanut butter stuffed dates. They’re so easy to make and are perfect for anytime you need a sweet treat! 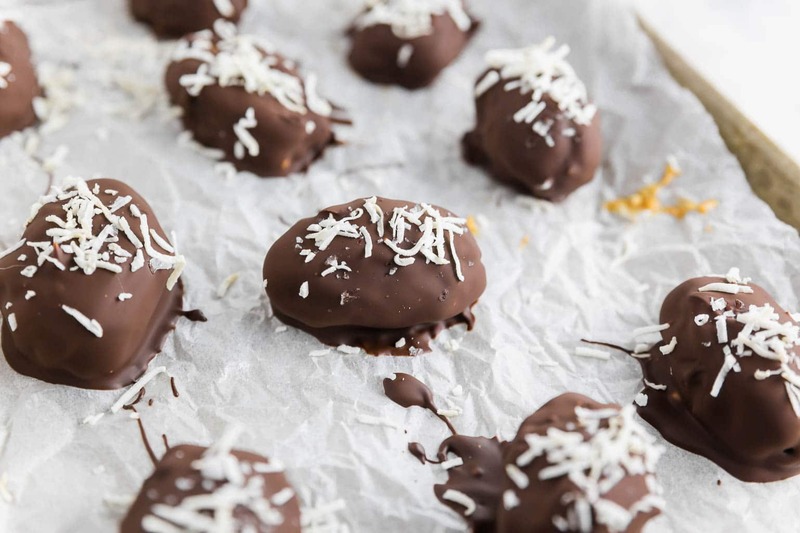 Chewy, caramel-like dates stuffed of creamy peanut butter and crunchy coconut flakes, and covered with a rich, dark chocolate, you really can’t go wrong with this easy gluten-free and dairy-free treat. Does this happen to anyone else? You’re trying to eat a bit healthier but you can’t stop craving chocolate and desserts? Yes? Okay, good. We’re all on the same page. This tends to happen every January though, right? New Year’s resolutions. We’ve stuffed our bodies full of cookies, hot chocolate and cheese all December. It makes sense that with a new year we might want to get a little restart on our eating habits. These chocolate covered peanut butter stuffed dates are a quick treat that helps with the dessert cravings. No, I’m not saying these are healthy. Because… chocolate. But, these also aren’t the worst things in the world you could eat. They aren’t deep fried, so I think we’re good. These stuffed dates really couldn’t be easier to make. All you do is slice open a medjool date to remove the pit and make room for the filling. Then, mix together the peanut butter and unsweetened coconut flakes and fill the dates. Dip in a melted dark chocolate mixed with coconut oil. Sprinkle with coconut flakes and flaky sea salt and let set! That’s it! I love keeping these peanut butter stuffed dates in the freezer for whenever I’m in need of a sweet treat. I just let them sit out for 5-10 minutes until they’re soft enough to bite into and dessert is served! Perfect for a little midnight snack at home or for serving to a crowd, they’re great to make ahead for easy preparation and consumption. What type of dates are best for peanut butter stuffed dates? The two most common types of dates that you can easily find at the grocery store are either medjool dates or deglet noor dates. Medjool dates tend to be the larger of the two types of dates with a chewier, almost caramel-like texture. Deglet noor dates are on the smaller side with a firmer texture. Deglet noor dates also tend to be the cheaper of the two varieties. For this recipe, I use medjool dates, since I love the chewiness of them. You could certainly use deglet noor dates if you’re looking for something on the smaller side, just keep in mind the differences! 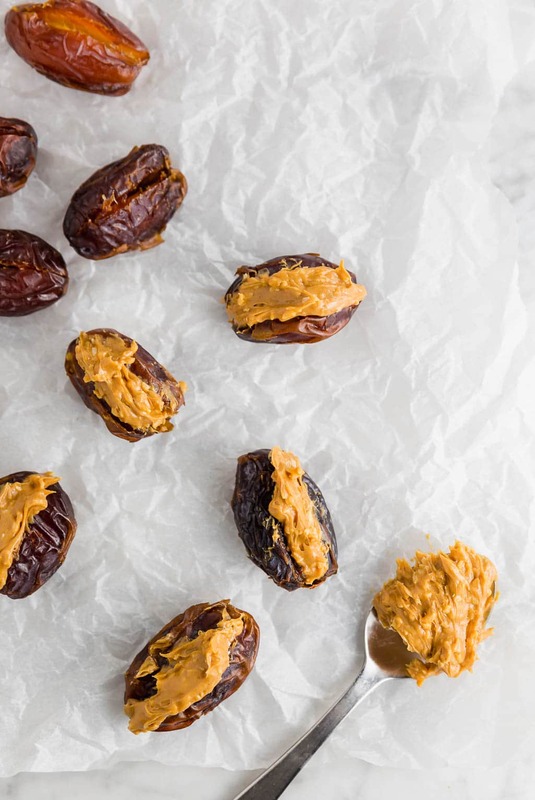 Can I stuff dates with other nut butters? YES! Almond butter, sunflower seed butter, cashew butter, pecan butter. So many nut butters, so little time! You can use any of these nut butters in this recipe. Keep in mind, most natural nut butters (even natural peanut butter) are on the runnier side. To make them easier to work with, after mixing the nut butter with the coconut flakes, chill for 30 minutes in the refrigerator to let the nut butter firm up. This way, the nut butter won’t be oozing out the sides of your dates. What else can I top chocolate covered dates with? For my version, I top these chocolate covered dates with shredded coconut and flakey Maldon sea salt. However, you can type your dates with whatever you like. I also love the idea of adding chopped up salted peanuts on the top to indicate that the filling is full of luscious peanut butter. If you’re using a different nut butter, such as almond butter, you could add slivered almonds to the top! 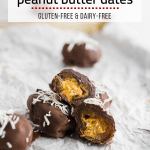 Some other fun ideas to top your peanut butter stuffed dates are mini chocolate chips, cacao nibs, a drizzle of peanut butter, or maybe even sprinkles! The sky is the limit! How do I make these stuffed dates dairy-free? 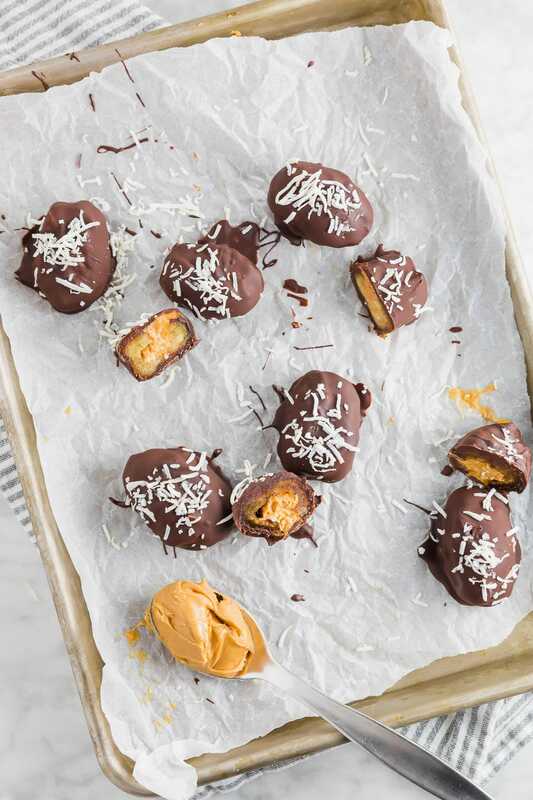 As written, I use a dark dairy-free chocolate to coat these peanut butter stuffed dates. Of course, you can use your favorite chocolate, but I find that a dark chocolate makes the stuffed dates feel extra decadent. I also use chocolate chips in this recipe, because that’s what I tend to have on hand. You can use chopped chocolate if you prefer. The brand of chocolate chips I used were the Guittard Extra Dark Chocolate Chips. I like this chocolate because it’s made in a gluten-free facility, however the warning statement on the package mentions that it is produced on the same equipment as milk chocolate, so if you have a dairy allergy I would select another brand. Some other great dairy-free chocolate chips are Enjoy Life Dark Chocolate Morsels, Artisan Kettle Chocolate Chips, and Nestle Tollhouse Simply Delicious Chocolate Chips. All are gluten-free and dairy-free! Love chocolate? Check out these other gluten free chocolate recipes! Whether you’re looking for a quick dessert to satiate your sweet tooth or a simple but rich party dessert to share, these chocolate covered peanut butter stuffed dates are for you! With just 6 simple ingredients, you really can’t go wrong with this gluten-free, dairy-free and vegan dessert. With only 6 ingredients, you'll love these chocolate covered dates. They're so easy to make and are perfect for anytime you need a sweet treat! 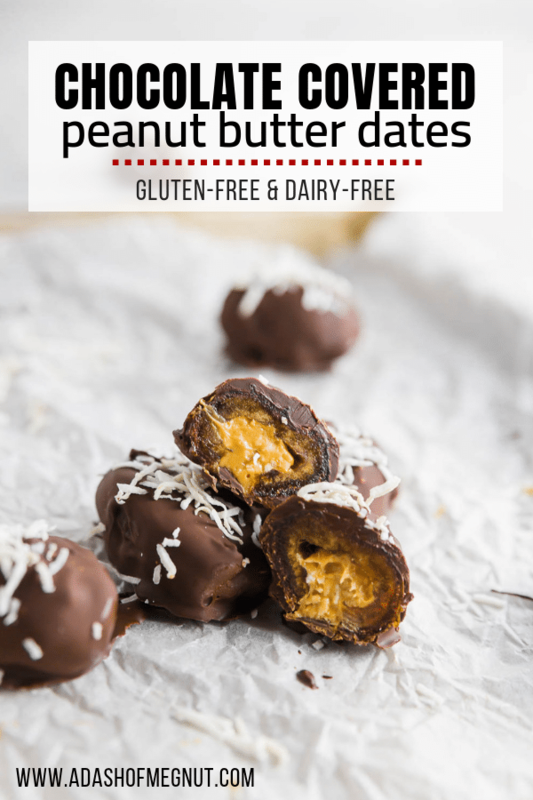 Chewy, caramel-like dates stuffed of creamy peanut butter and crunchy coconut flakes, and covered with a rich, dark chocolate, you really can't go wrong with this easy gluten-free and dairy-free treat. Prepare your dates by carefully slicing the top of the date horizontally, being careful to not completely slice through the entire date. Remove the pit and discard. Repeat with remaining dates and set aside. In a small bowl, stir together peanut butter and 1/4 cup of the shredded coconut until combined. Stuff the dates with the peanut butter coconut mixture. Place the chocolate chips and coconut oil in a microwave safe bowl. Microwave in 30-second increments, stirring in between, until chocolate is melted. Be sure to not overheat as the chocolate will burn and seize up. It should take 60-90 seconds total. Dip the peanut butter stuffed dates into the chocolate mixture and let set on a baking sheet lined with parchment paper. Sprinkle the chocolate covered dates with the remaining shredded coconut and a pinch of flaky sea salt. Let set in the refrigerator or freezer for at least 20-30 minutes until chocolate has hardened. Note: If you use a natural peanut butter or other nut butter that has a runny texture, chill the nut butter and coconut mixture in the refrigerator about 30 minutes before stuffing the dates to let the mixture firm up and make it easier to work with.